Ye Neo’s wise council was fulfilled soon after through Master Chee’s introduction to Great Grandmaster Yong Yuek (Yang Yue). Master Yong, a friend of his own grandfather, was destined to take Master Chee’s Gong Fu development to a new level, through teaching him amongst many arts, Wu Mei Style Gong Fu (a powerful, deadly Art developed by a famous nun of the Shaolin Temple). 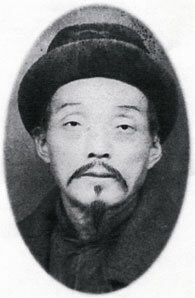 Great Grandmaster Yong Yuek (Yong Yue) was also a Master of the Wuxing Zhang (‘Five Element’) System, and introduced its arts and techniques to his young pupil, who avidly absorbed their form, philosophy, and applications. Great Grandmaster Yong was a man possessed of exceptional Gong Fu abilities, one of which gave rise to the pseudonym, ‘Spider Man,’ a name derived from the exceptional skills he possessed in the art of wall climbing. Perhaps, even rising above the importance of the special/secret arts he taught Master Chee, must be the spiritual significance of the virtue of Patience/Tolerance that he personified so deeply and extolled to his humble yet gifted student. Grandmaster Chee was the pupil of this remarkable man for fully three years.